Whenever I read a good book, I’d like to pass on a positive review. Last week, I commented on Lincoln, as his 200th birthday was upon us. I am presently reading Harold Holzer’s new Lincoln book (Holzer is a LIncoln scholar and a fine writer), Lincoln, President-Elect: Abraham Lincoln and the Great Secession Winter, 1860-1861. It is fascinating. What did Lincoln go through, what did he have to deal with, as he awaited his succession to the presidency? From November 1860 until his inauguration in March 1861, he was virtually powerless to make policy or to stop the secessions of Southern states. 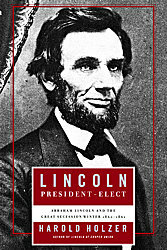 Holzer’s book takes you into Lincoln’s mind and details his activities during this crucial period in American history. What’s more, the writing makes you feel as if you are reading a novel. Even though I know the outcome, I find myself eager to know what is going to happen next. So, even if you are not a Lincoln admirer (which is really a sad situation), I heartily recommend that you read this book. It will be difficult to find a tyrant in the newly elected president as he prepares to shoulder the burden of a nation coming apart at the seams.